as if we didn't know that already. What does it mean to make a garden that is [insert verb here] speaking, studying, playing, arriving, pushing, pedaling, blushing, juggling? Can a garden--not a garden element, but the whole landscape--stand and stare, wobble, whistle or whirl? If you could make a verb garden, what would it be? I'm increasingly opposed to gardening as "art." Just let things grow; they looked nicer before you got your mits on them. i can see where susan in the pink hat is coming from, however I also believe that gardens need to be more than just pretty. They need to be thought provoking, vital, testing boundaries of the conventional too. I think Diana's work does that often. I posted this on Twitter, where there is a very active garden design community. I wish "Arcady" was there. Most responses were like Adrian's--that designs like these push the boundaries beyond the ho hum. There is a place for wild, natural gardens and for these and other artistic gardens. I'd be happy to see the ho hum in between disappear, however. This doesn't quite answer your question, but your post reminds of the work of Heinrich Wolfflin. Do you know him? He argued that that people respond to architectural forms (and hence, by expansion, to the shapes and patterns of gardens) anthropomorphically, as fellow bodies on earth: we sense soaring or toppling or unease, we breathe deeply on wide, open terraces, and more shallowly in narrow passageways. Our response comes from imagining how our own bodies would react in positions or postures similar to those of the constructed forms: we then share the physical responses (respiration and pulse rate, muscle tension) and the ensuing feelings (joy, tiredness, anxiety, repose). So balance and rhythm, symmetry and proportion are not learnt intellectual constructs, but qualities that naturally give us pleasure because we as humans stand and breath and balance. spilling, definitely. like a cross between alice in wonderland and the hanging gardens of babylon. Anytime you have more than one plant, there is some sort of arrangement, a conversation, between them...any larger garden is just an extension of that. The joy of a garden for me is actually more in this arrangement of space and substance--in the conversation--than in just the plant material itself. Even in the wild (and I live on the prairie, the real one, not the faux European Oudulf one) the delight I feel in the landscape is often in how the plants are arranged and how they speak to each other. 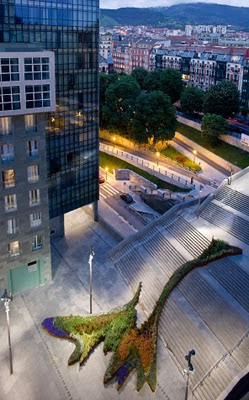 In artificial settings such as this (and obviously on a urban staircase there is no wild or natural) it is the arrangement--the design--of the garden that makes me think, not just look. Oops, it was Lynn that mentioned twittering. Sorry; Jill I meant to say thanks for the reference to Wolfflin, who I didn't know! What?! How completely odd and arresting. I've never seen anything like that. I'd never want to trade it for my "traditional" garden. It doesn't mean I'm not glad it exists, though. I understand some of the negative responses to this installation, however, I applaud any design that "propagates" thinking and discussion. 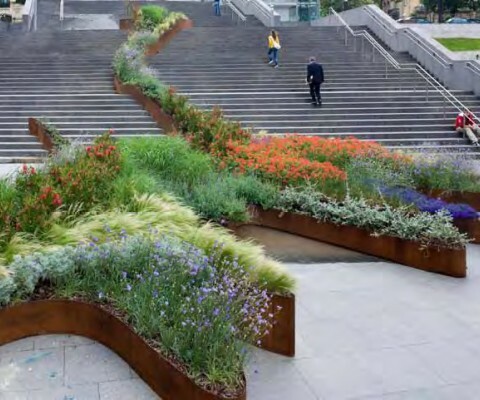 I also love when a designer introduces plantings into an urban setting in this way, making a bold statement about the interaction between nature and our man-made steel and cement environments. I'm a gardener and garden writer but my garden beds would never be written about because they follow no mathematical formula prescribed by designers. I love the lava flow garden - it appeals to my nonconformist nature. I must agree with Arcady - plants really do move, converse, compete,and complement one another, depending on the conditions. Closer to their original natural state must be a more comfortable space for them. I suspect that to really see them in action, one must spend time with them, morning to evening, and spring through fall. Our controlled and constricted gardens do not allow this. 1: I love the images. To me it seems like a wonderfully "organic" shape that's taking hold on the very rigid, explicitly artificial steps. I can't help look at it as poetry, as I was once taught that "poetry is language that says I'M LANGUAGE - LOOK AT ME!... This garden, too, seems to demand attention and to emphasise the point that it is a specific means of expression; something that has a meaning but also wants to draw attention to the medium it uses to convey its meaning. 2: What verb would I like to have as my garden? "Embracing" might be my word of choice; I want a garden that closes itself around me, leaving out the clamor of the World, but I also want a space that embraces different ways of being in a garden; room for quiet contemplation at one moment and an improvised game of football the next. A space that can embrace different activities - or lack of activity - and still seem perfectly suited for just that particular moment in time. Asphalt Rundown project of 1969. Except, where he envisions entropy, these designers take the outline of his formal structure, the surface, and fill it with the softness, aesthetic appeal, of various plants. In doing so, they want to utilize his efforts, his visual language for their own ends, which I think is to deal a blow to neo modern (postmodern, whatever we're calling it) architecture. I get this because I know that piece of art history, and I am sure they do, but I think the ordinary person simply sees a colorful spill, and it is somewhat empty of the aggression toward this type of architecture. I little bit like a cartoon brushstroke that parodies the expressionist brushstroke (i.e. Roy Lichtenstein). Hmmm, nycg...except that the Smithson seems to me to be about passivity (gravity creates the form) and this installation is explicitly active--climbing the stairs, fighting against gravity, making its own form. It's not a spill, though I agree that the viewer could read it as such, but the title shows its different intent. "Its lush planting cascades down as though the garden was flowing or melting, bleeding the colors into each other. 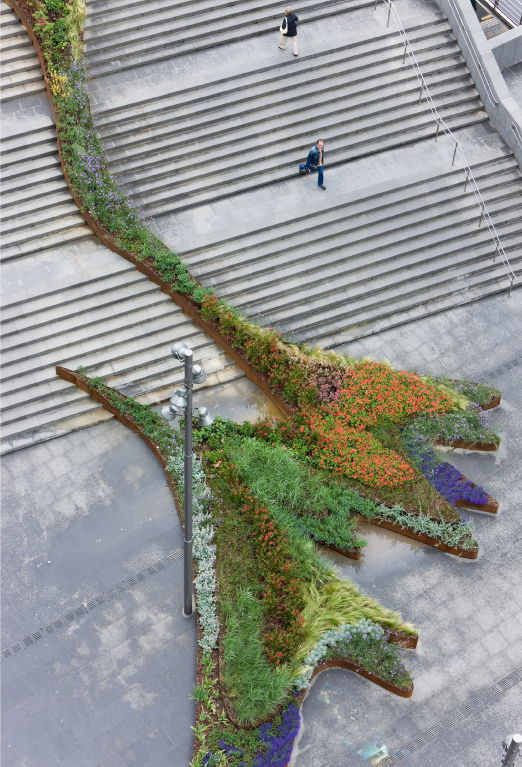 In one gesture, it narrates a story of landscape taking over and expanding over the Public Space and Architecture..."
Glad you brought it up! Good point...there seems to be a bit of a conflict between their narrative and their title; is it climbing the stairs or dripping down them? Either way, it's compelling...and I think the choices of colors and plant materials are equally as effective as the form in conveying motion and plasticity, in a more engaging way than Smithson's black asphalt, perhaps? Yeah, I agree it is more engaging for us and is effective. Smithson was entangled in seeing the end of things in things. His asphalt, which is decidedly not engaging, is dripping down a gravel pit. He had gone somewhere completely different from this group of designers. This is why I love to have sculpture in my garden--and not Home Depot junk, either. I'm ona garden tour this summer and will have a local artist install some pieces, but have been thinking if there was something temporary I could do with plants. I love these kinds of installations, to push boundaries, to experiment--and frankly, as is obvious with your example, poke into out everyday / stagante / inward / solpsistic / disconnected lives. That's what art does--grabs us by the colar and says "Hey, you still alive in there? Here's the world, be in it again as a child." i love this garden because it is provocative, and sculptural and unique! the good thing is that we don't have to pick one over the other when it comes to the organic or the structured. thanks for sharing it!